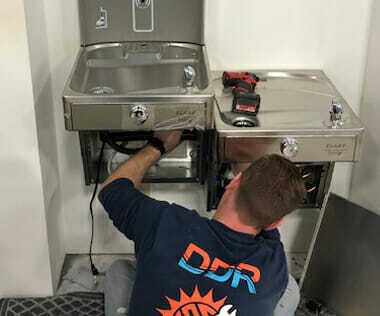 At DDR Mechanical We Do It All! Gas Furnaces: A powerful heat, natural gas heating systems contain the air distribution system and generate new heat. Gas furnaces are often more efficient. Electric Furnaces: The quieter furnace, electric systems are durable and quick to install. Contact us to find the best fit for your space. Air Conditioners: From large units to even larger spaces, we ensure stable cooling and humidity control. Ductless Air Conditioning: Enjoy the benefits of ductless AC, a system that distributes the air for efficient and steady comfort. Rooftop Units (Commercial): Many commercial businesses opt for a space saving rooftop system. These units are more easily serviced since they connect directly to a building’s ventilation system to circulate the air. Warehouses: Ensuring a consistent and humidity-free climate makes all the difference. From installation to maintenance and repair, we are available 24/7 to keep your space running at its peak. Grocery Stores: We help grocers ensure freshness and reduce food waste by maintaining steady and efficient temperature control. Convenience Stores: Our goal is to provide you convenience with reliable systems and timely response times to allow your customer flow to never be delayed. Medical Facilities: Where precision is key, and system malfunction is not on the schedule, we are here to keep your facility functioning and your patients safe. Cafeterias: We allow you to maintain consistent temperature control even during peak and high demand times. Refrigeration: Experienced and excited about what they do, our skilled staff arrive prepared to provide consistent and effective cooling you can rely on. Walk-In Coolers & Freezers: A vital component of your business, walk-ins can be maintained and repaired by our staff 24/7. Our staff maintains safe, high-performance freezers for consistent cooling. Supermarket Refrigeration: We preserve your facility’s steady and efficient temperature control to safeguard product freshness and minimize food waste. Bakery Refrigeration: Allowing your operation to sustain peek and timely performance, refrigeration system maintenance is critical. Restaurants: Consistent refrigeration and climate control are crucial when providing a comfortable space at peak times, while keeping your staff on track. We are here to help you maintain this vital component of your business. Reach-in Coolers/Freezers: Ensuring steady cool temperatures is crucial for your business and we’re here to safeguard that element.